My daughter is a big popsicle lover. Most kids are. I remember as a kid my mom pouring Kool-Aid into our popsicle molds and making Kool-Aid popsicles. I don’t see Kool-Aid in many houses anymore (we had sooooo many points that we never claimed, so sad,) but that does not mean we cannot enjoy homemade popsicles! Last year I made these awesome watermelon popsicles that were featured on Buzzfeed. This year, instead of a watermelon abundance, I had way too many strawberries. To cope with this issue, I decided to make some strawberry popsicles. However, after some research (and actually eating one) I am beginning to think these are more along the lines of strawberry sorbet popsicles. I wanted to call them thick popsicles, but that sounded weird… But they are thick. I mean, when I bit into one, it was so soft and yet not your traditional popsicle, and I loved it! I figured it was the fresh fruit that made the popsicles so thick, but whatever it is, they are delicious! Truth time: I did not know the differences between sorbets, sherbets, and gelatos so I had to look those up online. That’s where I got the idea to name these strawberry sorbet popsicles. Sorbets are usually non-dairy “ice creams.” They also use simple syrups so that worked perfectly with my naming process. 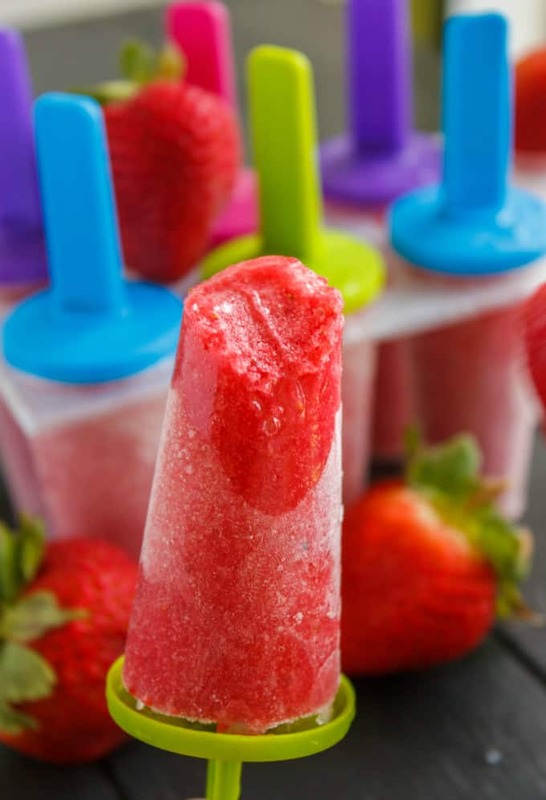 Now I have the urge to make an actual sorbet, but for now, these strawberry sorbet popsicles are the perfect individual servings. In a food processor, add the strawberries, pinch of salt, and a squeeze of lime juice. Puree until smooth. Add simple syrup and combine. Pour the liquid evenly into each of your popsicle molds. I made exactly 8 in mine, but every mold is different! Place your ends in and pop into freezer. *Simple syrup is made by mixing equal parts of water and granulated sugar and heating until all the sugar dissolves! It is so strange, but now that I think about it, I literally only make one popsicle recipe a year… Hmmm, I guess I have to change that! My daughter enjoyed these but I find she still prefers the store-bought (is she even my child?!!) I do try and keep the sugar content low, so maybe I am not satisfying her sweet tooth! She just likes to give me attitude and be difficult! On a final note, the strawberries can be replaced with any of your favourite fruits. Strawberry and banana would be nice for those who crave that combo. I am more of an ice cream lover (bet you cannot tell with those ice cream recipes I have on my blog…) I am seriously considering making these strawberry sorbet popsicles again and dipping them in melted chocolate… OMG, how good does that sound?! Don’t be surprised if you see that recipe soon! Popsicles always go over well in my house too! I love that you kept the ingredient list so short in these - it's perfect!! I'd forgotten about Koolaid points! I had so many unclaimed points too! So funny. I'm definitely making these soon. My kids love popsicles! Kool-Aid is probably laughing at our misfortunes! Thanks, Amanda! It's nice to be reminded that sometimes the simplest recipes are the best! My kids would love these and I have pinned to make soon! I agree, Emily! These are super easy and you can use any fruit. Popsicles tend to not last long very around here! This is such a great way to use up an overabundance of strawberries, which let's be honest isn't necessarily a bad thing. :) Love these! Haha, thanks, Justine. I could eat strawberries on their own any day! Ohhh these looks so refreshing and delicious! I would choose strawberry sorbet in popsicle form over strawberry sorbet in a bowl any day! Strawberries are always lying around in our house so I can't wait to make these! Hope you enjoy them, Meg. I love how simple these are to make! 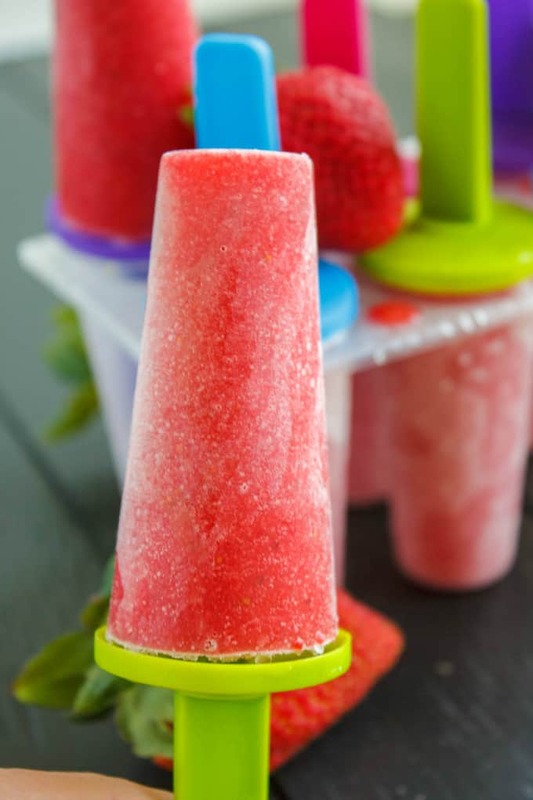 I grew up on Kool-Aid popsicles, too, but these are like a super gourmet version :) Can't wait to make them! Gourmet to the max! Thanks, Chrisy! These look so refreshing and delicious!! I lived on popsicles when I was a kid- we had twin pops and had to share and hope they broke correctly! These look so refreshing! Oh man, I haven't had any Koolaid in such a long time. These popsicles look so refreshing. These are totally my heaven! My niece would love me so much if I made these!! YUM! Then I say hop to it :) Haha, thanks for stopping by, Becky!